Apple doesn’t care if competitors have cheaper products. It doesn’t care if its next big thing cannibalizes its last big thing. Not about buying big money-makers, and certainly not about how you think it should deal out stock. 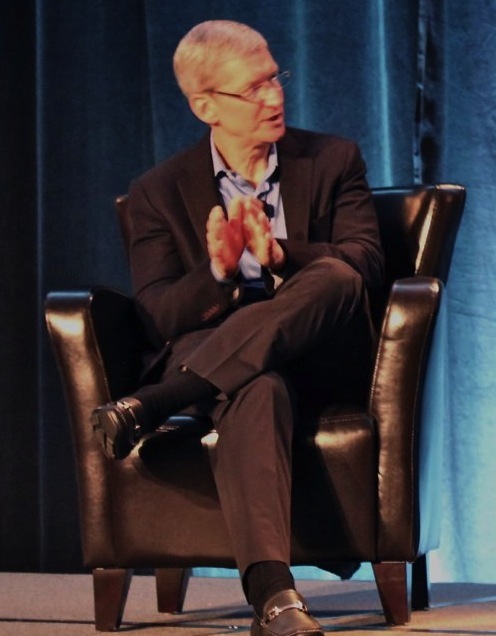 Today at Goldman Sach’s conference, Tim Cook played the defiant king of an empire too powerful to be distracted by the present or the past. All he sees is Apple’s future. The Wall Street Journal has a great play-by-play of Cook’s hour-long talk, and we’ve picked apart the highlights. But what really matters is that Apple’s size and momentum give it a unique advantage in the tech world — the ability to make tunnel-vision an asset and not a liability. Apple is too big to pivot nimbly. It’s a freight train going full-speed and Cook’s in the boiler room screaming at soot-covered engineers to shovel more coal into the burners. The iPad is crushing the tablet market, so Apple will make more iPads. The average Apple store earns $50 million a year so it’ll build 30 more, including in China and other international locations like Turkey. Shareholders love when Apple hands them money, and it’s got plenty, so it is returning $45 billion to them and ignoring the “silly sideshow” lawsuit about how it approves preferred stock handouts. Cook knows the track is laid out in front, so he doesn’t need to nitpick the horizon in order to drive. Sure, there are cheaper smartphones out there, but the nagging schizophrenic voices are what really threatens Apple. Dividing resources to make a ‘good’ cheaper phone could prevent it from making what Cook considers far and away the best phone. The suit & tie attitude for big businesses is not to build products that cannibalize your existing ones. Apple’s a turtleneck tech company, though. A tie-less Cook said on stage that “Our basic belief is, if we don’t cannibalize, someone else will.” So if it sells fewer iPhones or iPods because it makes an iWatch, fine. Better than people buying a Samsung Galaxy Watch S 7 or Google Time, or whoever tackles the wrist eventually. People thought Apple was crazy for making the iPhone when its iPod business was doing so well. Crazy like a fox. Crazy like a honey badger. Honey badger doesn’t care. And finally, you’re not going to see Apple shaking in its boots about some big revenue-generating business and buy it. It’s got its own roadmap and acquires companies to make the magic happen faster and stronger. Cook said “If a large company could help us, then that would be of interest.” Otherwise, the cash stays in the bank. Or more specifically, foreign tax shelters. That doesn’t mean there aren’t dead-ends for Apple to crash into, or problems in the engine room. Ignoring the landscape only works if you keep guessing right, and human crystal ball Steve Jobs isn’t around anymore. Maybe smartwatches aren’t what’s next and Google Glass style eyewear is. A big mobile product blunder could throw Apple off the track real quick. The biggest lie Cook told today was that “Apple has skills in software.” Judging by Google’s invasion of our homescreens, Apple’s software skill is sorely lacking. If smartphone hardware tops out and handsets become more of a shell around software, Apple could sees its locomotive start to sputter. But Cook seems keenly aware that the greatest dangers to Apple are slowing down or getting distracted. “We’re disciplined and thoughtful” said Cook, with his eyes on the prize. Jobs was heralded for his focus, and most people worried that no one else could keep Apple in line the same way. Today, Cook looked Wall Street dead in the eyes and made it clear he won’t flinch. He won’t waffle. He doesn’t care. Cook is the honey badger, googoo g’joob.